Governance, risk management and compliance, or “GRC”, is growing in usage as a term to describe the discipline of having executive oversight and management, meeting designated standards, complying with laws and regulations, and assessing and mitigating risk to the organization. Many of the elements involved in meeting compliance and regulatory requirements are best managed by content and records management systems, particularly where core business processes are document-centric. ECM and RM also come into their own for the management of policy records, internal audit evidence, or documents related to an incident. BPM and workflow systems can provide automated scheduling and approvals, management dashboard and reporting, and risk and compliance monitoring. 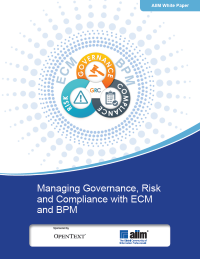 Download this white paper as it highlights many specific issues related to policy lifecycle management, operational risk control, internal audit, and supply chain management, but a common thread found is that key documentation is not stored in one place, processes are inefficient and manual, and systems are home-grown.